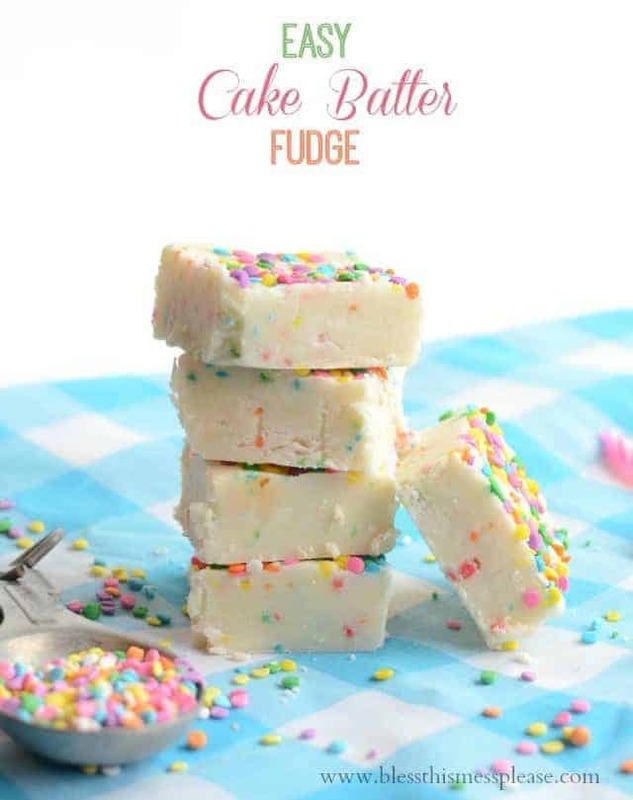 Cake batter is such a great flavor. I love cake and it’s totally fun when that flavor makes an appearance in non-cake items. Our favorite is cake batter ice cream. We have a shop here in town that’s open for a few hours a day during tourist season. After a morning of garden work and chores we like to treat ourselves to a little scoop of ice cream once in a while; cake batter gets chosen more times than not. 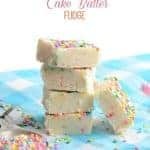 This cake batter fudge is just as fun as it sounds, and it’s super easy; no candy thermometer needed! 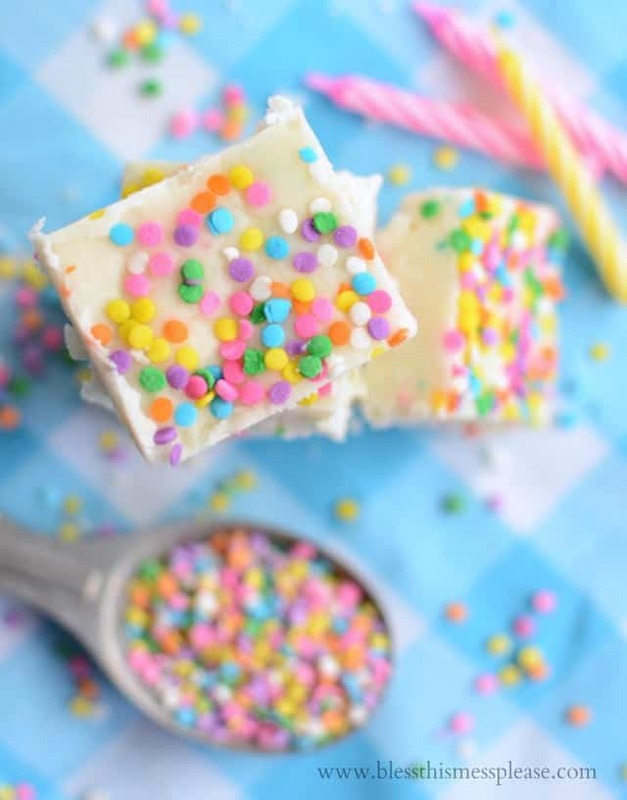 You’ll love all the sprinkles and how festive it looks. 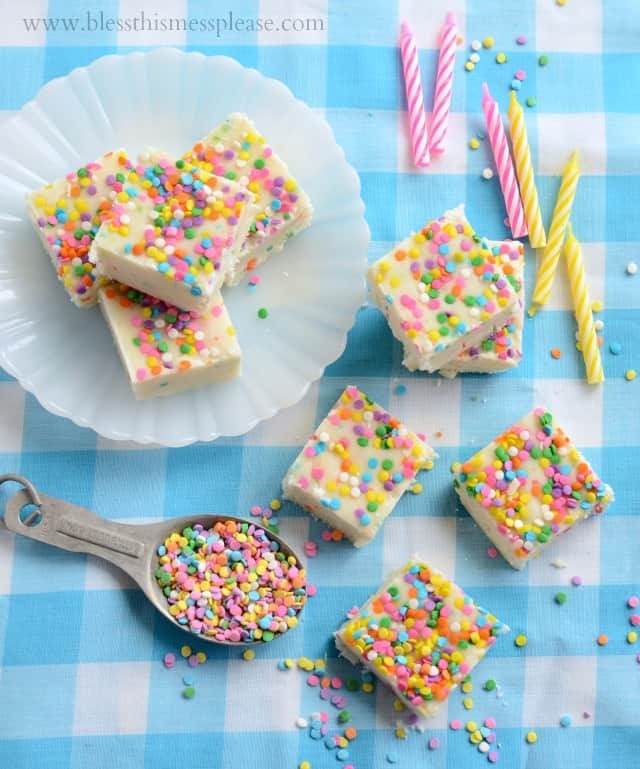 This is a great little treat to make and take to friends for their birthday because it’s so easy and doesn’t make an enormous batch. This cake batter fudge is just as fun as it sounds, and it’s super easy! No candy thermometer needed! The perfect, simple treat to take to birthday parties. Spray an 8 by 8 inch square baking dish with cooking spray and set side. In a medium microwave-safe bowl add the cake mix and the powdered sugar and whisk to combine. Add all of the butter and the milk to the bowl but do not stir it in. Microwave on high for 2 minutes. Take the bowl out of the microwave and add the chocolate chips. Then stir stir everything in the bowl together. The mixture will be very thick. Stir until there is no powder left and the chocolate chips melt. Spread the warm mixture evenly into the bottom of your prepared pan. Use your hands or the bottom of a measuring cup to press and smooth the top down. 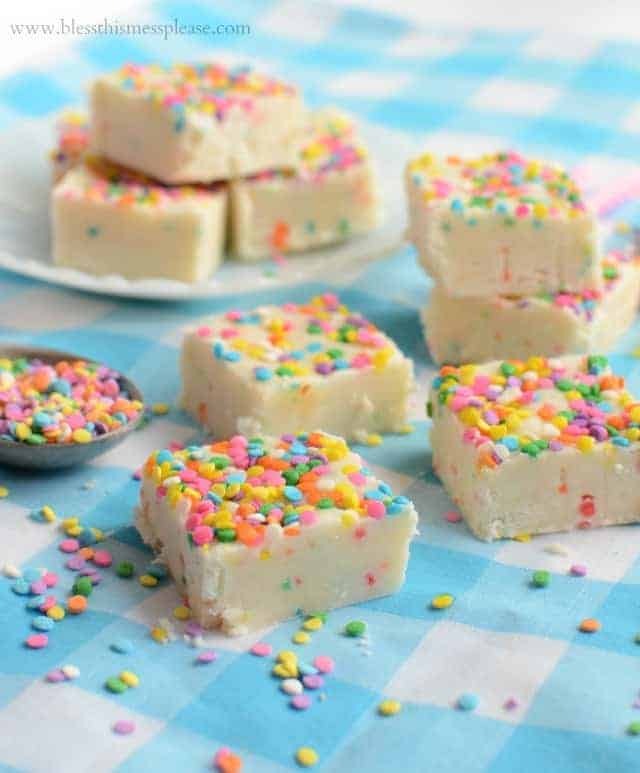 While the mixture is still warm add the sprinkles to the top and press them lightly into the surface of the fudge so that they stick. Cover and refrigerate for at least 2 hours before cutting and serving. Store any left overs covered in the fridge. This recipes was inspired by and slightly adapted from Sally’s Baking Addiction. Just melt the needed things using a double boiled on the stove! It’ll work just the same. Ohhhh my! I am a diabetic and can feel my blood sugars rising just by looking at the pictures! 🙂 I am wondering can this be frozen so that I could MAYBE have one small piece every few weeks? That is the problem being single and diabetic. Make something for dessert, and it has to be small so that either it does not go bad quickly, or that you can freeze most of it for later! Yes! It freezes great. Even with our family of 6 I threw have of it in the freezer and just pulled a piece or two out at a time! You will love it Denis! This looks so amazing! I just printed it out and will be making a batch in about half an hour. Sorry to reply to my own comment but wanted to report how this came out. It was beyond easy!!! Didn’t have white cake with sprinkles so used a white cake mix which my 3 year old grandson kind of put way too many sprinkles in! Didn’t have white chocolate chips so we used Andes Candies peppermint chips. Pink fudge! Same grandson got to choose sprinkles for the fudge once I had it in the pan and smoothed out. He choose purple and yellow sanding sugars. What can I say? He’s a genius! Definitely a keeper recipe. Easy to make, fun for kids, doesn’t heat up the kitchen and it’s so tasty too. Thanks Melissa for posting this one! Hey Melissa, can you tell me if I can do this with other cake mixes besides the white cake mix? You sure can! Let me know if you get any other awesome combos going! I used 2% or whole probably, so just normal milk!